Do you have fun with your math lessons? Do you like to have some online math practice for your child(ren)? 3P Learning has just the thing for you! They have this fun online math program called Mathletics. 3P Learning is known for their online Reading Eggs program and now they have added to that collection with Mathletics for the math fun! Mathletics is an online math program for grades K-12. There are 10 levels of learning available starting with simple 1-10 adding and going all the way up to logarithms and algebra. There are lessons and games that work on building your math skills and improving them. As the teacher (with the teacher account), you are able to pick and choose the level you want your child to be at. This program is CCSS aligned, which we didn’t care for, but worked around it. As a part of the program, you are able to access the printable workbooks. These range from basic shapes to Trigonometry! 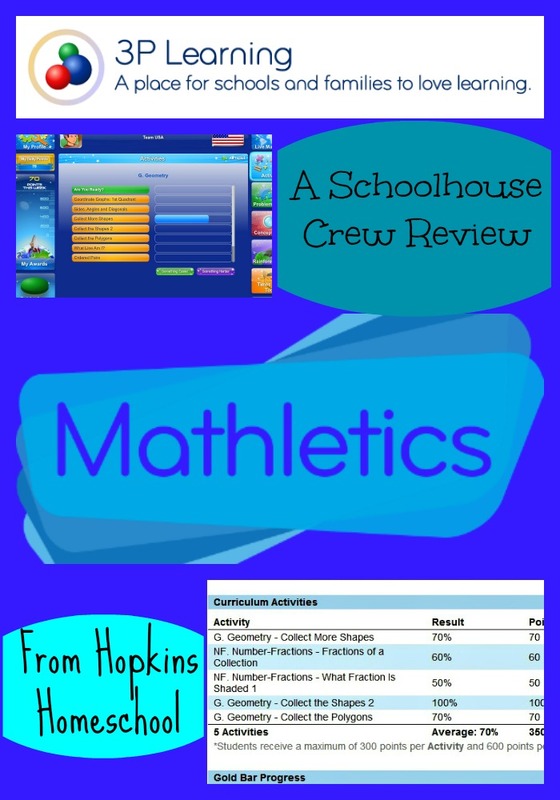 Mathletics is used by students worldwide in homeschools and classrooms. We have math programs that we are using, but the boys had fun doing “games” instead! As we went about our days, we would pull Mathletics up when the kids needed a break from “regular” school work. The boys would be busy playing the games and slowly advancing to the next level. I would work with Ray Ray on the topics he didn’t understand by using the printable workbooks. He enjoyed this way of learning math and I loved knowing that he was understanding what he was learning. Both of the boys would compete against each other and themselves to see who could get the most points from day to day. I will get emails from Mathletics once a week letting me know how each child is doing. How much they are doing and how well they are succeeding in their studies, or what they need to work on more. Once getting everything set up, it was very easy use. Simply remembering your username and password is the hardest part (that is where a nice notebook with all those comes in handy). We had an issue of slow internet when we first started using this. It made it difficult to load some pages, but once we fixed our problem, we have been speeding through the pages. Moe Man is not a math boy. He never has been, but I was able to get some interest out of him with this program. I feel that because it was not a textbook or anything resembling school, he gave it a better chance. Moe Man may be in the 8th grade, but I had him working on 6th grade math with this and he was still challenged. Ray Ray loves anything that allows him to get on the computer. He went into this and was happy instantly. He was a tad upset when he couldn’t go as fast as he wanted. Like I said earlier, once we fixed our problem, he was a happy camper again. For $59 per child per year, I find the total adding up a little too much for me. But we did not use this as a full curriculum like you are able to. If we would have done that, I could see justifying the cost since a full curriculum usually costs that or more. If using this as a supplement like we did, the cost doesn’t make sense. Would I recommend this to others? Only if you are first, ok with Common Core, and second if you are going to be using this as a full curriculum or have extra money in your budget for this. I am not the only reviewer who tried out this program. Head on over and see how everyone else felt about Mathletics. Don’t forget to stop by and show your love to Mathletics by checking out their Facebook page and their Twitter page.